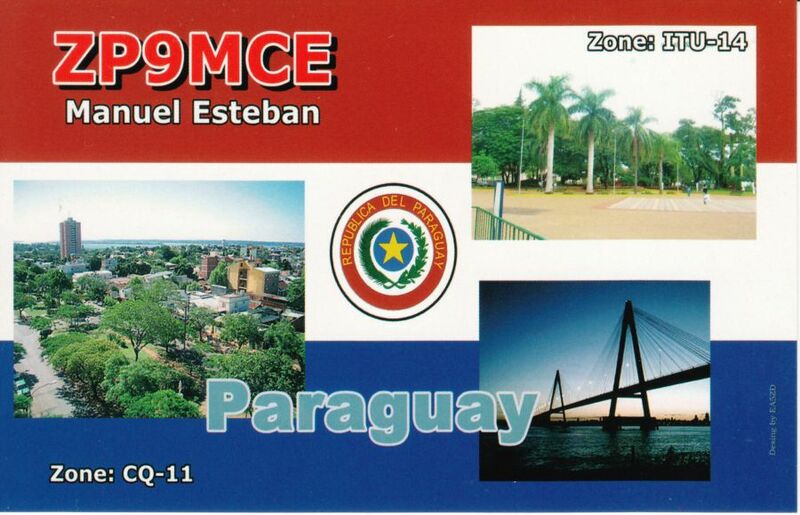 ZP9MCE will be active from Paraguay in CQ WW WPX CW Contest, 26 - 27 May 2018. Special recommendations: there is certain risk associated with travel to certain areas of Paraguay. Because of high criminal rate associated with drug cartel activities, it is not advised to travel to following departments: San Pedro, Amambay, Canindeyu and Caaguazú as well as region that borders with Brazil. One of most corrupted countries in South America requires careful planning and preparation before visit to it. Paraguay covers 406.000 square kilometers in South America. On North-West it borders with Bolivia, on North-East it borders with Brazil, and on Southwest it borders with Argentina. It is only country besides Bolivia in South America that doesn't have exit to sea or ocean. Geographically, river Paraguay divides country to northwest, low and rarely inhabited region of Gran Chaco, and east hillside region where highest peak of Cerro Pero stands (842 meters high). Around 6,2 million people live in Paraguay and they are considered to me the most homogenous population in South America. As much as 95% of population is considered to be ancestors of Spanish conquistadors and local American Indians. Small part of population are communities from Germany, Japan and other world countries. Agriculture and electric energy are main export goods of Paraguay, and unfortunately, lots of country economy is consumed with corruption. State capital and largest city is Asuncion, located along the bank of river Paraguay, on border with Argentina. Paraguay cuisine is combination of many different influences and it very resembles to those in other countries of South America, particularly Brazil. It is based on majority of roasted, not very seasoned meat that they combinet with vegetables, particularly potatoes, eggs and diary. It is interesting to mention that Paraguay soup-Sopa Paraguaya –where tortillas are deep-fried and contain flour and cheese. Food is served with juices, beer and alcohol drink like rum-cana-made of sugar cane. What are tourist attractions and sightseeing spots in Paraguay? Paraguay doesn't have sea, but it has Ypacarai lake on southwest of country. San Bernardino city is located on its coast and is very popular summer destination. It is also known for exciting nightlife, usually enjoyed by younger people. Visit small city Itagua near Asuncion and discover everything about colonial architecture of region and traditional crafts. This city is ideal destination to buy handmade souvenirs at affordable prices. Ineteresting tourist destination is hydropower Itaipu, located on the river Parani that borders with Brazil. Annulay it produces up to 94,7 tWH that satisfies 95% of Paraguay and 25% of Brazil need for electricity. Itaipu on guarani language means singing cliff. Explore Asuncion and its significant spots. You can visit amazing newly built congress building, main city cathedral as well as tumb of unknown heroPantenon- nacional de los Heroes. There are many museums to visit as well as parks inhabited by exotic bird species. Tourists love to visit picturesque city Pilar on southwest of country. It is located on the banks of river Paraguay, and is known for several fishing competitions. It is perfect destination to explore numerous colonial buildings dating from end of 18th century. In Paraguay many people still awe someone called Francisco Solano Lopez (Fransisko Solano Lopes), whose statue is posted in the center of Asuncion. Lopez was dictator who started to rule when he inherited throne after his father, who ruled Paraguay from 1862 to 1870. He was paranoid megalomaniac who killed members of his own family because he suspected they were plotting against him. He lead devastating five-year war against Brazil, Argentina and Uruguay when almost 3/4 of entire country population (!) got killed. This is not all. His mistress was notorious Elisa Lynch, who loved to parade on front line dressed at latest Paris fashion style, while normal Paraguay people were starving. Paraguay has sad reputation for being most corrupted country in South America; home to smuggling; state that was under dictatorship for almost 200 years, and became free in 1989. Still, Paraguay is country that is far from distant country-it is a country that truly represents spirit of South America. Typical city in Paraguay looks like collage of peeled walls, dusty streets and warn-out faces with pleasant smiles for everybody. Everything looks like Wild West, but much less dangerous. Paraguay is an exile country. British writer Graham Greene loved it. He lived and wrote in Gran del Paraguay hotel in Asuncion, colonial building with best restaurant in Paraguay. Among exiles in Paraguay are also 10.000 Mennonites- men are dressed in bleck and women are covered from head to toe, so you only see their pale faces, red from intensive sun. They speak certain version of German language called Platdeutsch and have local newspapers called Aktuelle Rundschau. Paraguay has certain handicaps (chaotic capital city, huge differences between ricxh and poor, unstable political scene) that affect majority of other nations in South America. However, it doesn't have certain qualities that other South American countries do have. For example, as it doesn't have exit to sea, it doesn't have beautiful Brazilian beaches; it doesn't have Andes and majestic Machu Picchu as Peru. But it has some other natural beauties, and there is an interesting story to it. When Bess Truman, American president Harry Truman eife saw river Iguazu waterfalls, she said : “Poor Niagara falls”. It is clear why she said that. There are not many waterfalls in the world that are this majestic and in such spectacular surrounding. Three kilometers wide and 75 meters tall, waterfalls run down two large cascades from south Brazilian plateau into deep canyon. It is surrounded by subtropical rainforests that are even more luscious thanks to constant moisture of waterfalls. River Iguazu is natural border between Brazil and Argentina, and waterfalls can be visited from either of these two countries. From Argentina side you can come closer to waterfalls but from Brazilian side you can better see their majestic beauty. Right next to border with Brazil is city of Ciudad del Este that looks like giant flee market. Several thousand people from Brazil cross bridge over Parana river to buy cheap goods. Streets of this chaotic border city are filled with shops and stalls that sell everything from cheapest audio equipment to affordable t-shirts. Sellers will try to get your attention from everywhere around. When you manage to get out of this crowd, cross the bridge to Brazil and you will experience completely different world, because tourism brought lot of money to city Fos do Iguacu. ZP9MCE. Where is Paraguay located. Map.